LS-F31216 is an enzyme-linked immunosorbent assay (ELISA) development kit that contains sufficient reagents to produce approximately 1000 Wells for the Quantitative detection of Mouse CCL21 / SLC. The kit is supplied with the components listed below, a list of other recommended reagents, and a protocol (see manual) for preparing ELISA assay plates to detect levels of CCL21 / SLC within a range of 16 to 1000 picograms per milliliter. Each of the components supplied with this kit are tested and quality controlled in order to assure that they meet the specified standards. 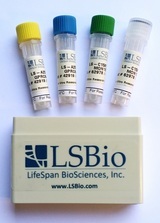 These components have also been empirically tested together in a Sandwich ELISA assay, from which the range and sensitivity listed above were derived. Due to the many variables that can occur when preparing and running ELISA plates, we are unable to guarantee the final range and sensitivity of the end-users assay. By following the recommended plate preparation and assay protocols included in the supplied manual, the end-user should be able to achieve comparable results.